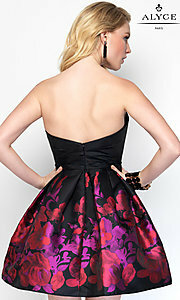 The red floral print makes this gorgeous short black homecoming dress come alive with color. The strapless designer dress by Alyce has a pleated crossover sweetheart bodice that is uniquely beautiful on its own. Bold splashes of color make the short pleated skirt a delightfully vibrant work of art. A sweet small bow adds just the right vintage touch to this classic cocktail party dress. Create a stir at homecoming in this stylish taffeta party dress that showcases your flair for fashion.